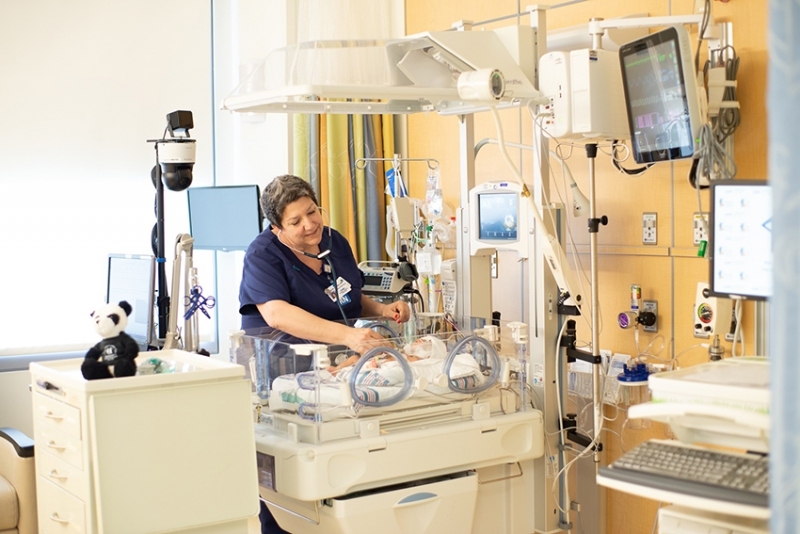 Children’s Hospital of Michigan in Detroit has developed Michigan’s first Neuro-Neonatal Intensive Care Unit for preterm and term newborns who have neurological complications. The unit is one of a few across the U.S. and has a team of specially trained physicians. It is a Level IV neonatal intensive care unit, offering the highest degree of care for premature or critically ill newborns. “This program is aimed at ensuring preterm and term newborns at risk for brain injury and future developmental problems are meticulously cared for by a team of specialists,” says Dr. Girija Natarajan, co-chief of the division of neonatology, clinical operations, and education at Children’s Hospital of Michigan and Hutzel Women’s Hospital. Offering a six-bed unit housed within part of the newly expanded and renovated single-room neonatal intensive care unit on the third floor of the hospital’s tower, the program will offer neurological assessments, diagnostics, neuro-protection therapies, and advancements in neurodevelopmental care. It is a collaboration between neonatologists, pediatric neurologists and neurosurgeons, pediatric neuroradiologists, neonatal nurses with special interest in brain injury, EEG technologists, psychologists, occupational therapists, physical therapists, dietitians, and social workers. Transport cooling by the Tecotherm device with the dedicated pediatric and neonatal transport team will allow infants with birth asphyxia, a condition in which a baby doesn’t receive enough oxygen before, during, or just after birth, to be started early with cooling and transported to the unit. Cooling can help prevent complications and death that arise from birth asphyxia. The program also will provide prevention and treatment of neonatal brain hemorrhage and its complications among extremely low gestational-age neonates. After patients are released from the unit, continuum of care includes a multidisciplinary developmental assessment clinic in which all neonatal neurocritical care patients are followed for five years. Care will incorporate specialists from physical medicine and rehabilitation, neonatology, and neuropsychology. The center will serve as a regional referral center for advanced neonatal therapies or for coordination of complex care requiring multiple types of pediatric specialists. “The opening of this state-of-art neonatal care program will greatly enhance the research capabilities of Children’s Hospital of Michigan and elevate its position as a premier center for research trials in neonates in the state and the country,” says Dr. Seetha Shankaran, neonatologist at Children’s Hospital of Michigan and Hutzel Women’s Hospital and principal investigator for the first randomized controlled trial conducted by NICHD Neonatal Research Network on whole-body cooling for hypoxic-ischemic encephalopathy. The significant benefits of cooling in reducing death or disability shown by the trial she led established cooling as standard of care throughout the world. The Children’s Hospital of Michigan has served the region for more than 130 years and has more than 40 pediatric medical and surgical specialty services. It sees more children than any hospital in the state.